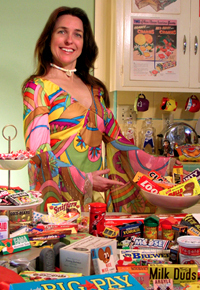 As some of you may know, but most of you probably don’t know, I have been collecting candy wrappers for my museum since I had a mad vision as a teenage girl in the 1970s. This decade was arguably the heyday for candy, with most of the classics from previous decades still kickin’ and all sorts of new bars appearing on the scene. A chocolate shortage did cause prices to rise and sizes to shrink in that decade, but that didn’t stop the country from loving their candy and celebrating it with mega-hit, toe-tapping songs! One of the hip new bars on the scene was the Yours Chewly, Ward Candy’s chewy candy bar made from tantalizing artificially flavored SUPER CHOCOLATE! This candy bar had it all: a wacky name… mod, irreverent 70s art… and a huge candy bar for twenty cents. And if that was not enough, the Ward Candy Company also treated the discerning candy buyer to the irresistible offer of 1000 LABELS WITH YOUR NAME AND ADDRESS… FREE!… just by sending in 10 Yours Chewly wrappers. The perfect offer for the snack-happy sophisticate, who undoubtedly would be posting thousands of letters around the world every year, with each signed: “Yours Chewly”. and pondered how many licks it took to get to the center of a Tootsie Pop. Sadly, somehow the Yours Chewly didn’t survive past those days, but at least this wrapper did so that we can imagine the fun of plunking down in front of the TV set or clamping on a huge set of headphones and digging the chewy groove of the Yours Chewly bar. This entry was posted in Art and tagged 1970s candy, 70s candy, candy history, Candy Wrapper Museum, Ward candy, Yours Chewly. Bookmark the permalink. Darlene: You Rock!!!! Very nice writing! Keep it up. Love Aunti !!! !